The VAFP mission statement’s length belies the importance of the work we do: To support Virginia’s national, state and regional parks. We give voice to those who love our parks. Recognizing the potential for strengthening volunteer park support organizations in Virginia, the Virginia Association for Parks (VAFP) was launched at a statewide park volunteer training conference held in November 1997. Since then, VAFP has grown to become the nonprofit umbrella organization for the respective citizen support groups (friends groups) and individual volunteers supporting the 37 state parks, 62 state natural areas, and the 22 national parks, monuments and historic sites throughout Virginia. The association advocates for park issues at all levels. It also offers free technical advice and assistance to those who wish to form a new support organization, and we conduct semi-annual conferences that include training sessions and networking opportunities for the exchange of ideas that work. In 2007, the VAFP was awarded the National Association for State Parks' President Award to recognize their commitment to supporting Virginia State Parks. Visit this page to learn more about the award. 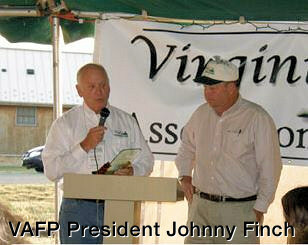 Visit this page to learn more about VAFP projects. Visit this page for a list of state park friends groups. You can lend a hand. Keep up with us by joining us on Facebook and check out our Flickr photo collection. We’re also working on a YouTube channel so stay tuned. Sign up for the Virginia State Parks newsletter.